Hi guys! I have an Avery Elle card to share with you today using some of the new dies and stamps:) This is one of those cards that stayed with me all week. I mean it literally stayed with me all week. I am still finding sequins, glitter, and confetti all over the house! I'm sure it drives my husband and sons crazy, but I secretly love it! 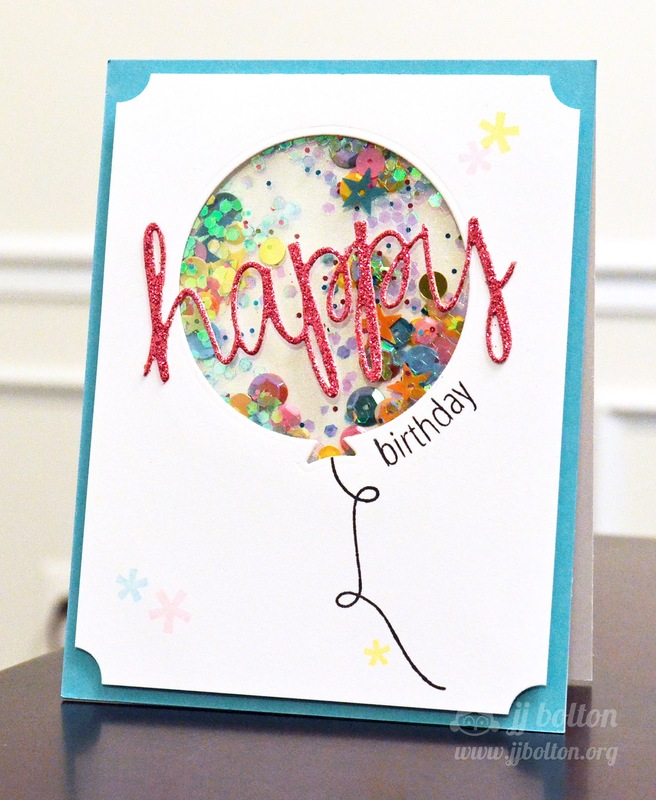 For this card, I used the largest die of the Balloons die set to create the shaker frame. My nieces 6th birthday is coming up and she's all about the pink and shiny! Frankly, I'm all about the pink and shiny too, so this was a fun card to make. I filled up my shaker with different sized sequins (flat and cupped/matte and iridescent), hex glitter, and confetti. I know some folks wipe their acetate and paper with a swiffer sheet, dryer sheet, or embossing buddy, but personally, I like to keep some of the static cling. I like the way the fillers stick around the shaker instead of just falling to the bottom. Nothing more sad than an empty looking shaker! For the sentiment, I used a die cut word using the new Simply Said: Happy die and matching stamps. The balloon string and the asterisk stamps are from the Balloons stamp set. With the stamps and the dies, you can seriously make birthday cards for days! Until next time! Hope you're having a great week! This is sooo FUN! Love it! What a fun card! Way to embrace the static cling!! I think I'm just going to have to do that since it seems like I can't eliminate it no matter what I do! Pink and shiny is popular in our house too! Love all the fun glitter in that balloon! Very happy shaker card JJ! How cute is this? 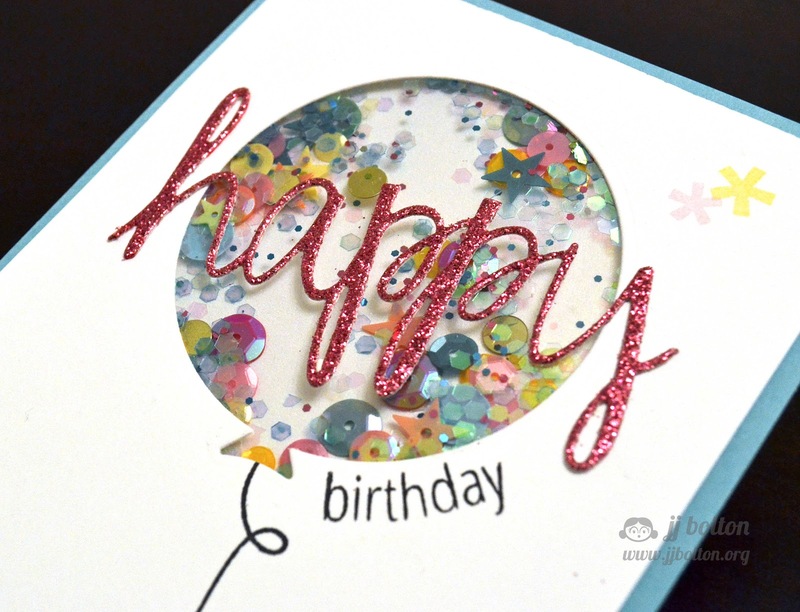 I LOVE the fun red shimmer birthday die cut and your glitter chunks. FABULOUS card!! Such a cute card. Love all the "fun" stuff in the shaker. That must be the most amazingly happiest balloon EVER!!! LOVE!!! JJ, this is so much FUN! Such a fun and sparkly card! I, too, don't mind a little static...gives it more character and this card has a lot of character! 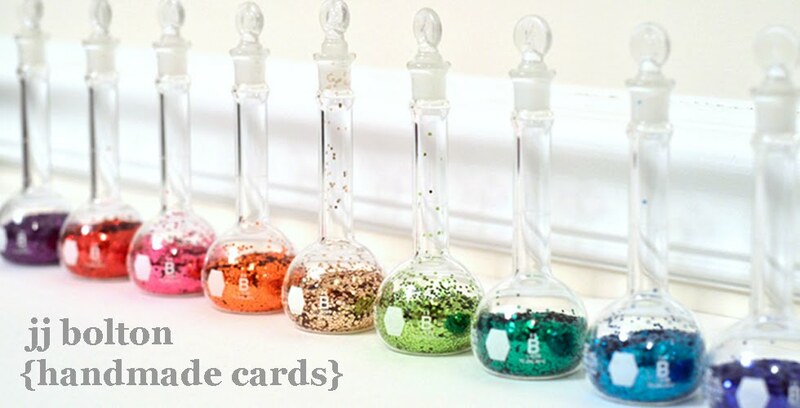 LOVE this fun and sparkly shaker card, JJ! You always know how to showcase new products beautifully!!! Love this happy shaker card! Just lovely in every way! Studio Calico Penny Arcade Reveal!